The race for Alaska governor looks to be a three-man contest, though some are still seeking to pressure the Democratic challenger to bow out. 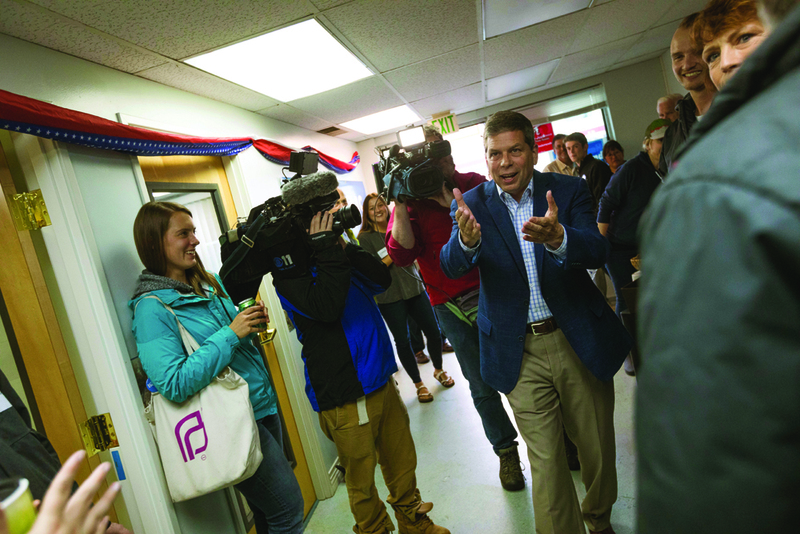 That Democrat, Mark Begich, said he’s not going anywhere: “I’m in the race,” he said. During the Aug. 21 primary, Republican former state Sen. Mike Dunleavy advanced to the general election, where he is expected to face Begich, who was unopposed in the Democratic race, and Gov. Bill Walker, an independent who skipped a head-to-head primary fight with Begich and instead gathered signatures to appear on the November ballot. Walker’s move was intended to ensure that he could run as a team with his Democratic lieutenant governor, Byron Mallott. Walker in 2014 changed his party affiliation from Republican to undeclared in forming a so-called unity ticket with Mallott that was backed by Democrats. Some Democrats and independents worry that Begich and Walker will split the vote and hand the race to Republicans. But Begich has said he wouldn’t have gotten into the race if he didn’t think he could win, and he and Walker have each been full-steam ahead with their campaigns. A former chairman of the state Democratic party, Don Gray, has circulated a petition, asking Begich to withdraw. Those who have signed include members of Walker’s administration and others who support Walker. Libertarian William “Billy” Toien is also running. Dunleavy on Tuesday topped a crowded field in the GOP gubernatorial primary that included former Lt. Gov. Mead Treadwell, who had fashioned himself as the more experienced candidate. Dunleavy in January left the state Senate after five years to focus on his campaign. While a senator, he clashed with GOP leaders over cuts to the annual check Alaskans receive from the state’s oil-wealth fund and over what he saw as insufficient cuts to the state budget. Dunleavy said he likes his chances against Walker and Begich. “I feel we’re on the right side of the issues,” Dunleavy said Tuesday night. “I feel that Alaskans want to send somebody down to Juneau that they feel is going to fight for them.” Juneau is the state capital. Begich said he plans to outwork his opponents and continue to travel the state to share his message with Alaskans. He said a majority of Alaskans are looking for a change. “The majority is not with the current governor. The majority of Alaskans are looking for something different,” Begich said. In the Democratic U.S. House primary, independent Alyse Galvin advanced to challenge GOP incumbent Rep. Don Young, 85. Young is the longest-serving member of the U.S. House and easily won his primary. The Alaska Democratic party changed its rules to let independents run in its primaries if they want the party’s backing. Galvin, an education advocate who has a reputation for being persistent, planned to greet supporters Tuesday night and get them ready for the challenge ahead. Party primaries for governor and lieutenant governor determine who runs as a ticket in November. Candidates who bypass the primaries and instead gather signatures to appear on the general election ballot — as Walker opted to do — have a say in their running mates. The next governor will face big issues, including crime and the economy, and decisions on the annual check that Alaskans receive from the state’s oil-wealth fund, the Alaska Permanent Fund. Dunleavy and Treadwell had positioned themselves as conservatives critical of a 2016 criminal justice overhaul and the state’s approach to budgeting. Both supported the formula in state law for calculating the oil-wealth check, which has been ignored, first by the governor and then by legislators, for the past three years amid a budget deficit. Bolin said she supported Walker in 2014 and could possibly do so again in the general election, saying they share personal values. She said she wanted to hear more from the candidates before deciding who she thinks could best get the state out of its financial difficulties. In east Anchorage, Bill Cody voted for Treadwell, whom he said made the most sense to him. Cody voted for Walker four years ago but didn’t like the governor’s handling of the Permanent Fund dividend. Cody’s wife, Holly Cody, also is an undeclared voter, but she voted on the Democratic ballot. In the U.S. House race, she supported Democrat Dimitri Shein. She said she met Shein and he left a good impression. The primaries also include a contested GOP race for lieutenant governor and state legislative races. Of the candidates in the Democratic U.S. House race, Galvin and Shein, a Russian immigrant who became involved in politics after President Donald Trump’s election, most actively campaigned. Young faced a primary challenge from Thomas “John” Nelson and Jed Whittaker, who had limited resources and little name recognition.